It might be more of an American tradition than a British one, but there’s no denying that Halloween is fun. It’s a perfect excuse to get dressed up, play games and get into the spooky spirit. So if you’re looking to entertain the kids this Halloween, why not throw a ghoulish party. 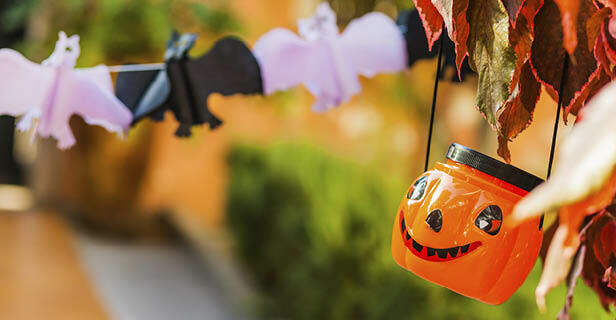 Here are our top tips for a Halloween Spooktacular on a budget. Halloween is the perfect opportunity to get creative. Cooked sausages, with an almond placed on the end, make perfect shrivelled dead men’s fingers. Chicken wings marinated in a dark, sticky BBQ sauce make fantastic bats wings. And a big bowl of strawberry jelly – with a few spooky sweets, like foam teeth, jelly worms and gobstopper eyeballs thrown in – makes a brilliantly disgusting bowl of blood and guts. And it can all be washed down with a glass of fresh blood (otherwise known as cherryade). Obviously carving pumpkins is a must. But you could also try cutting out spooky shapes, like spiders, bats or witches hats from coloured paper (think colours like black, purple, green and orange) and sticking them around the house. You also often find that supermarkets have some great offers on and you could pick up fun party props like cauldrons, grave stones or hanging skeletons for a few pounds each. A party wouldn’t be complete without games. Here are some of our frightening favourites…. Make a mummy – Get into pairs, then race your friends to make your partner into the best mummy you can. All you need is a few rolls of cheap toilet paper! Handful of horrors – Cover a few old shoe boxes in black paper, and some spray on spider web if you want to make them extra creepy, and cut a hole in one side, just big enough to fit your hand into. Then use your imagination to fill the boxes with gruesome things to fool your friends. Gross, is that gloopy intestines I just stuck my hand into? No; just some cooked spaghetti in tomato sauce. Yikes, is there a huge hairy tarantula inside?! Don’t worry; it’s just a ball of black felt with pipe cleaner legs. Horrible hide and seek – Just like normal hide and seek, but played completely in the dark. Make sure you put anything breakable away first! Let us know your ideas for holding your perfect, petrifying party!